The Sig Saur P226 has been around for several years now but has proven to be quite the weapon. 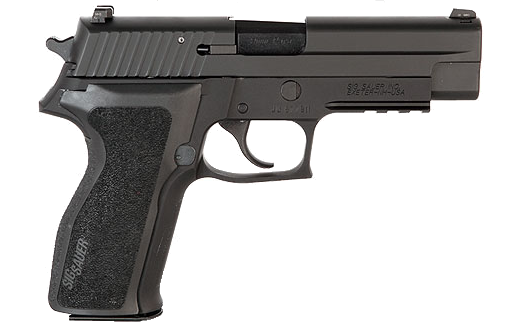 The P226 was designed as Sig’s entrance to the military trials to replace the ever famous 1911. The P226 is used by such fine people as the U.S. Navy Seals, Texas Rangers and many other military and law enforcement agencies. I recently purchased a P226 in 9mm. The P226 also comes in .357 and .40 S&W. When shopping around for a 9mm put quite a few different makes in my hands, but when I grabbed the 226 the first time I knew it was the one for me. I will be the first to tell you that I prefer a large frame pistol mainly due to my hand size. Another thing that I liked about the 226 was the weight and balance of the weapon. The true test came the first time I fired the gun for the first time. With the first shot I understood why so many military and law enforcement groups had chosen the 226. The first day shooting my new Sig I shot nearly 200 rounds without any issues. The 226 was very consistent the whole time. Out of the nearly 200 rounds only one round did not hit the silhouette, and that was at 25 yards and the target was swaying. Yes, that means it boiled down to my timing, not the Sig’s performance. For anyone looking at the Sig P226 for a future purchase I would not hesitate to recommend it. The ergonomics and the performance sold me. You can follow Benjamin Wallace on Facebook. I must agree Ben, the 226 is one fine weapon. I have put countless rounds through mine and never had a problem. It’s hard to go wrong with a gun that so many police and military personnel depend on.